Is Growing Sweet Corn Easy?? Definitely!! Growing sweet corn really only involves 3 easy steps - planting, watering and harvesting. Of course you'll probably need some fertilizer along the way, too, but we'll get to that. There are many varieties of sweet corn. Most varieties grown by the backyard vegetable gardener are either white, yellow, or a combination of the two. side for proper pollination. Because the rows should be set 3 feet apart, you'll need at least 50 square feet of garden space at a minimum. There are some new varieties of sweet corn that have been developed to grow specifically in containers, but we don't have any experience growing those. Sweet corn is typically planted in the spring for harvest in the late summer. It thrives when daytime high temps are in the 70-80 degree F range and the seeds can be planted when the soil temps reach 60 degrees F. Most sweet corn varieties are ready for harvest in 70-85 days from germination. Most sweet corn varieties grow 6-7 feet tall and are ready to harvest 75-95 days after planting. Each plant will produce 1-3 ears of corn, depending on the variety planted. SE, or sugar enhanced hybrids, have the highest sugar content of any sweet corn varieties. 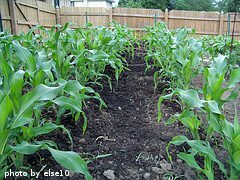 They do not need to be isolated from other sweet corn categories when planted in the garden. SH2, or super sweet hybrids, are very sweet and have a crisp texture. They must be planted separate from other corn varieties to prevent cross-pollination. SU, or normal sugar hybrids, have the highest yields. However, they are not quite as sweet or crisp as the SE or SH2 varieties. The flavor and texture is very good. 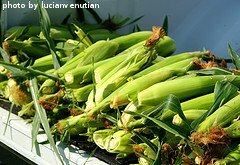 SU varieties are considered the standard of quality among sweet corn varieties. No isolation is needed when planted with other sweet corn varieties. Heirloom sweet corn is known for its full flavor and substantial texture. Some heirloom varieties can be traced back more than 100 years. Heirloom sweet corn should be planted away from other corn varieties to prevent cross pollination. 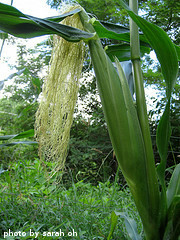 Click on the following links for information about growing sweet corn. Questions About Growing Sweet Corn?